For six seasons beginning in 1996, the CBS cop show Nash Bridges was a fixture here. 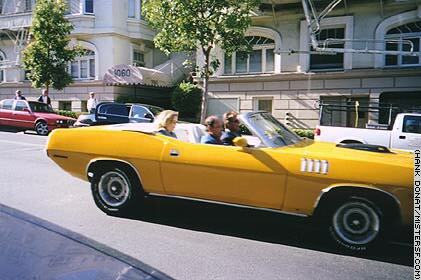 You never knew when you'd turn the corner and see Don Johnson and Cheech Marin tooling around town in a yellow 1971 Plymouth Barracuda convertible followed by a camera crew. Though nowhere near the quality of scripts from the '70s Streets of San Francisco, Nash, as anchored by aging party guys Johnson and Marin, became the '90s successor to the Karl Maldin series. Johnson got into a public relations folderol and potential legal hassle when he allegedly - and perhaps characteristically - got drunk and hit on a woman at Mas Sake, 2030 Lombard Street, a Marina sushi restaurant in February, 2000. For the out-of-towner, Mister SF notes that if every drunk who ever hit on a woman in a Marina sushi joint were given two inches of press you could climb to the moon on Chronicles. Nash Bridges was canceled by CBS in May, 2001.